This is the first year I’ve had an actual tree at home. I’ve always liked the idea, but never bothered — too expensive, too much work, I’m always away from home for the actual holiday, etc. But this year, I decided I really, really wanted one, and made a point of inviting a couple of people over to help decorate it so we’d have to face our friends’ shame and scorn if we backed out. [side note: shame really is the most interesting emotion, don’t you think? so twisty and personal.] I have a bag of ornaments I inherited when my parents sold their house, and a string of lights is easily procured. Initially, I was thinking of going old school for the garland and stringing popcorn and cranberries, but decided I’d rather have something we could use again. 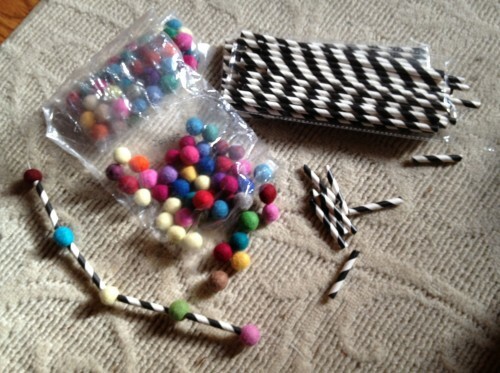 I bought 50 black and white paper straws, though I only ended up using 25 of them, and 200 15mm assorted wool felt balls. Then it was just a matter of cutting the straws into quarters and stringing them on dental floss or doubled thread with the balls. 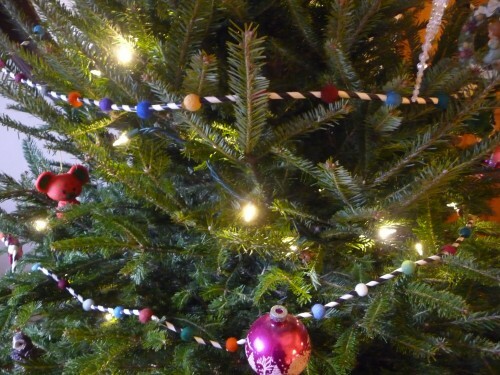 I did need a sewing needle–even my sharpest embroidery needle wouldn’t go through the felt– The garland came out a little short, so I may get another 100 balls and add to it before next year, but I’m still really happy with how it turned out. I really like graphic black and white with pops of color; it manages to evoke both Marimekko and Dr. Seuss and to be cheerful without screaming CHRISTMAS!!! at everyone.